Introducing Pyle 6 channel Marine Amplifier that has an incredible sound and lots of power without the distortion. It could run for hours and it will still be cool because it has built in thermal for short circuit protection. Wire the front channels to increase the output power to 600 watts per channel. Try the 6 full-range channel and enjoy the powerful sounds that come from a sleek amp. The full-range wireless bluetooth audio receiver is the perfect solution for anyone seeking excellence. You'll love the sound of purity and clarity. Aside from that, it is capable of powering multiple sets of component, pro audio, or coaxial speakers, it packs the power that will allow your speakers to come alive. Connect and stream from external devices like USB or SD card reader pair of RCA jacks on the rear of the amplifier, to external smartphone, computer, MP3, laptop or tablet. Featuring a high-speed power supply, Class D protection circuitry, advanced electronics, and other internal high quality components. It shines when compared to anything in its class when it comes to power and reliability. The class D circuitry equipped in this amplifier allow it to reproduce extremely clean output, for the best possible sound on your boat or in your vehicle. 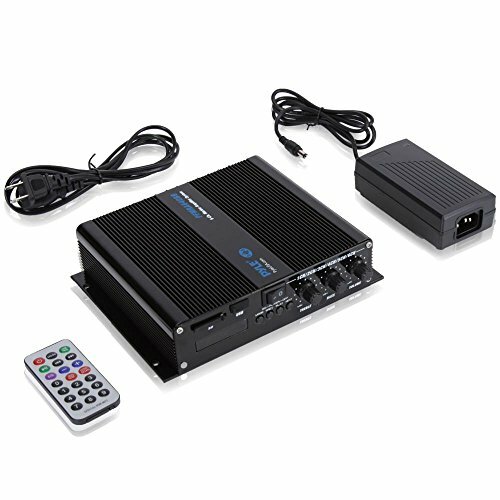 Moreover, this extremely efficient, 6-channel 600 watt outdoor amp is fully marinized grade construction and heavy duty aluminum alloy heatsink. Truly, lives the one and only legacy of an auto amplifier. Sold as: 1 Weight: 4.15 lbs. ADJUSTABLE TREBLE BASS EQ: Bass signal output can operate independently and the bass amplitude range is fine-tuning. The subwoofer output is controlled separately. May appropriate to adjust the style effect according to your needs for sound effect. HIGH-FIDELITY STEREO DESIGN: Pyle 6-channel subwoofer amplifier with 600 watt RMS at 4 ohm impedance and frequency range between 10-40kHz for unrivaled sound superiority. Compact marine grade rating at IP-41, class D circuit and RCA audio connector. WIRELESS BLUETOOTH CONNECT: Built in 2.1 version and that ranges up to 50' + feet and has thermal power protection circuitry and variety spring loaded speaker terminal. Also, installed with HD sound and LED digital screen that your stereo is working. AUXILIARY INPUT: Save MP3 audio files to a memory card and play back through the USB or SD card reader pair of RCA jacks on the rear of the amplifier, to external smartphone, computer, MP3, laptop or tablet. Connect and stream from external devices. QUALITY PACKAGE: It has multi channel, a perfect separate subwoofer output, volume, treble and bass, which can be accessed in the side panel button control center. It is made durable marine grade construction and heavy duty aluminum alloy heatsink.